Here at The New Yorker by Brendan Gill was one of my best book finds in 1975. This delicious history was a page-turner for me. It began my collection of books about the magazine as well as books by regular contributors to The New Yorker. 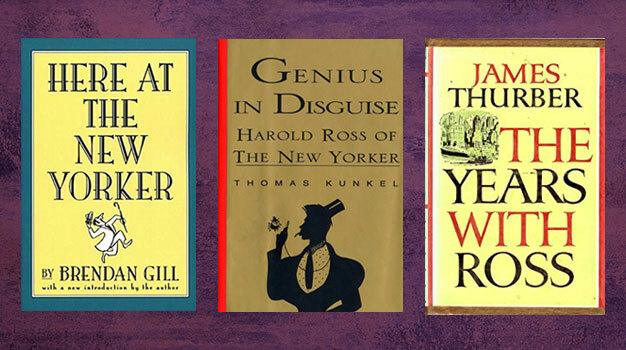 In 1995, when Genius in Disguise: Harold Ross of The New Yorker, written by Thomas Kunkel, was released, I couldn’t put it down. The Years with Ross by James Thurber (1959) is told from another viewpoint, equally fascinating. Writing this has helped me realize I need to re-read these books! I am grateful to Harold Ross for crafting a magazine that has sharpened the minds of generations of readers. Today, I read their articles daily online, thankful for the journalism that keeps me informed about the world.